The American Association of Port Authorities (AAPA)…the unified and recognized voice of seaports in the Americas…will recognize 25 seaports for exemplary communications projects and programs at its annual convention and awards luncheon this fall. Winning entrants in AAPA’s 48th annual Communications Awards Program will be recognized at a Nov. 4 awards luncheon in conjunction with AAPA’s 104th Annual Convention and Expo in Miami, which runs Nov. 2-4. The 2015 AAPA Communications Awards Program, which had a May 1 deadline for entries, utilized 46 professional public relations practitioners from the Washington, D.C. area who cumulatively spent about 180 hours over a period of two-and-a-half weeks judging the 15 classifications of entries, ranging from advertisements and periodicals to videos and websites. Based on the number of points awarded each entry by the judges, 25 submissions from 12 ports earned an Award of Excellence, while 31 submissions from 11 ports scored an Award of Distinction, and 40 submissions from 16 ports received an Award of Merit. To recognize the highest scoring entries into the competition, three ports will receive trophies at AAPA’s annual convention awards luncheon in Miami. The highest overall scoring entry, in the Special Events classification from the Port of Los Angeles, will receive AAPA’s prestigious “traveling” Dan Maynard Communications Award for Overall Excellence for one year, together with an engraved wood-and-brass plaque to keep. 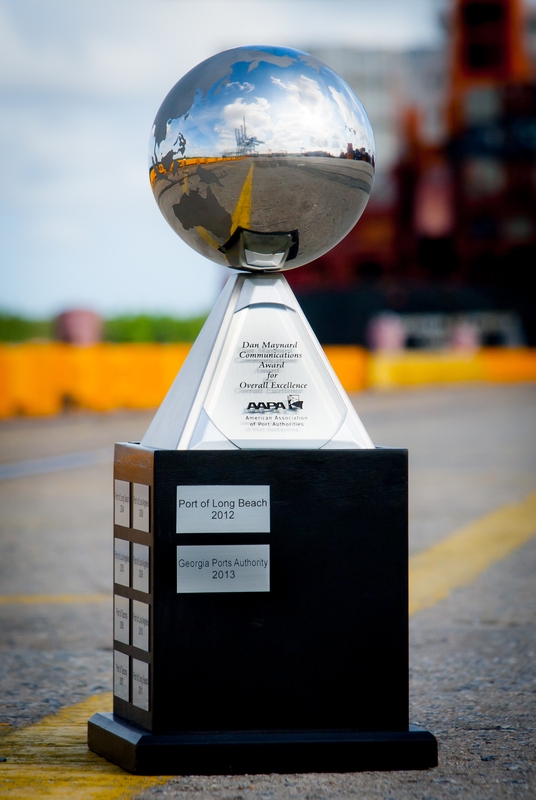 The second highest overall scoring entry, in the Websites classification from the Belledune (New Brunswick) Port Authority, will receive AAPA’s Overall Award of Distinction trophy, while the third overall highest scoring entry, in the Promotional/Advocacy classification from the Hamilton (Ontario) Port Authority, will receive AAPA’s Overall Award of Merit trophy. To see all of the winning entries in the 2015 AAPA Communications Awards Program, click here.